I've been skeptical of video on cell phones for some time. I've mentioned it here and here. I've been meaning to blog about it for a while. Hunter (who runs some segment of video for Google and/or YouTube) reminded me to finally do it, so I am. There are a number of real challenges to mobile video. Technology can solve many of them at some level. But one of them is much more fundamental and does not have a real technological solution. That problem is driven by biology, and by market forces. There are also a number of business issues involving the cellular carriers, but we'll assume the carriers will wise up at some point and those will go away. Batteries are getting better all the time. Mobile bandwidth is also improving (here in the US it lags, but that too will pass). Storage is always getting cheaper. Clever engineers can make good UIs. Screen resolutions are getting higher and higher. Technological advances will solve many problems, but Moore's law will never give us better eyes. A biological fact: Human eyes are limited in their capability. Very small complex video images, even at very high resolution, are difficult to see. It has more to do with the angle subtended in your field of view than with how many pixels there are. If you get a small screen close enough to your face to subtend an acceptably large angle, it will be too close for your eyes to focus on. A market reality: People really like small cell phones. A) On one hand you have a downward market pressure for smaller and smaller handsets. B) On the other hand to make video viable and viewable a handset needs to have some minimal X-Y dimensions. If the dimensions required by B are greater than the maximum acceptable mass market size defined in A, cellphone video will be niche. The iPhone will provide an interesting test here. There's been a lot written about the iPhone; battery issues, connectivity issues, storage issues. The one thing that is seldom discussed about the iPhone is how physically large it is. It's bigger than an iPod. It's bigger than a Treo or a Blackberry. It's MUCH larger than a RIZR or a KRZR. It's big enough to need a belt holster. It's smartphone size and smartphones are a niche market. 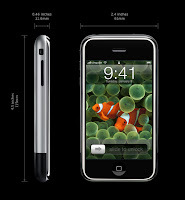 The iPhone has 3.5 inch screen. I suspect that's about as small as you can go for an acceptable video experience. But a 3.5 inch screen necessitates a really big phone. FWIW, I rarely see people watching video on their video enabled iPods.